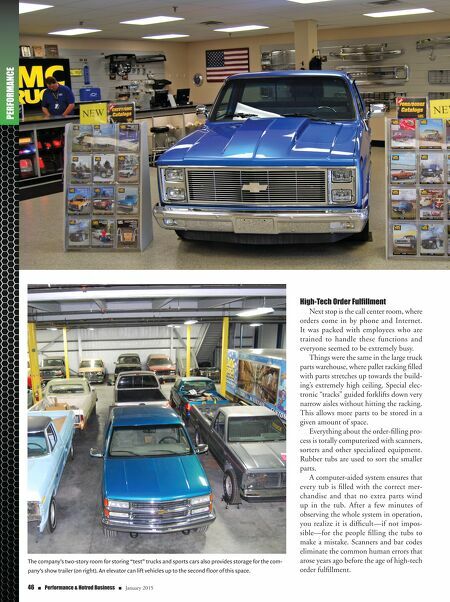 46 n Performance & Hotrod Business n January 2015 PERFORMANCE High-Tech Order Fulfillment Next stop is the call center room, where orders come in by phone and Internet. It was packed with employees who are trained to handle these functions and everyone seemed to be extremely busy. 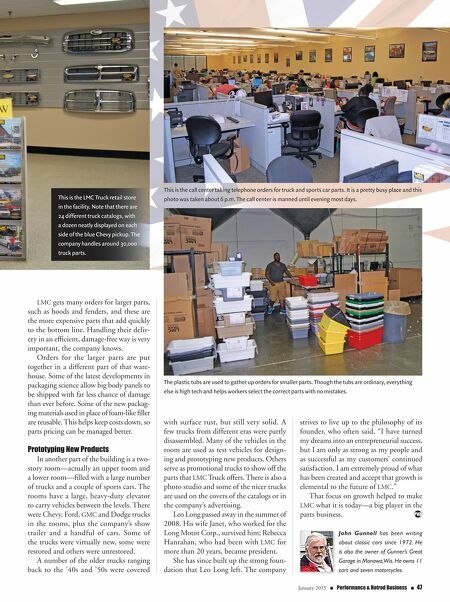 Things were the same in the large truck parts warehouse, where pallet racking filled with parts stretches up towards the build- ing's extremely high ceiling. Special elec- tronic "tracks" guided forklifts down very narrow aisles without hitting the racking. This allows more parts to be stored in a given amount of space. Everything about the order-filling pro- cess is totally computerized with scanners, sorters and other specialized equipment. Rubber tubs are used to sort the smaller parts. A computer-aided system ensures that every tub is filled with the correct mer- chandise and that no extra parts wind up in the tub. After a few minutes of observing the whole system in operation, you realize it is difficult—if not impos- sible—for the people filling the tubs to make a mistake. Scanners and bar codes eliminate the common human errors that arose years ago before the age of high-tech order fulfillment. The company's two-story room for storing "test" trucks and sports cars also provides storage for the com- pany's show trailer (on right). An elevator can lift vehicles up to the second floor of this space.